Day one saw director Edward Mellors joining the crowds to get a real feel for the theme park and market, which boasts 40,000 visitors at peak season. We want to bring back the wow factor to Skegness. Our family are showmen – it’s what we do. Mr Mellors, whose father James and brother James Jnr are also company directors, introduced the first urban beach concept to the UK and was already feeling at home by the seaside. He told the Skegness Standard: “We are very excited about adding Fantasy Island in Skegness to our theme parks. “It was just a coincidence that our park in Dubai has the same name. We’ve had it for three seasons now and it has been a challenge with all of the local restrictions, but it came good at the right time for us to be able invest here. “The building blocks are already in place for us to look at ways we can reinvigorate the park. “We are fortunate in that we own a substantial number of rides and are very well-placed to move things around and give it fresh feel. “Just after Easter we are planning to bring in a new ride and will have a rolling programme of improvements. “We want to bring back the wow factor to Skegness and are looking foward to working with other businesses in the area. Our family are showmen – it’s what we do. “But this is day one. We have a team just walking around today, watching the flow of the crowds, looking at what the customer sees, speaking to people and seeing what we can tweak. As the crowds grew, visitors and traders were talking about a new buzz in the air. This is the 14th season for Annette Pration, who opened the Sweet Shack with her late husband, Phil. She said: “I haven’t been down here myself for two years because my husband had cancer and after he died I wasn’t sure if I wanted to come back. 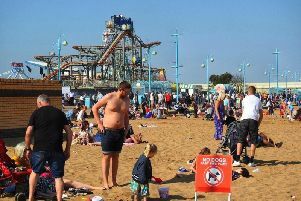 “We’ve been in limbo while Fantasy Island was in administration but since the announcement was made about the new owners the place has started to buzz again. Visitor Samantha Gore from Arnold in Nottingham decided to surprise her three children with a trip to Fantasy Island for the opening. She said: “It’s my birthday and they thought they were going to Matlock. “We came by train and when we arrived they said ‘this looks like Skegness’. A firework extravaganza is organised for this evening to bring the opening celebrations to a close. For more on the plans for Fantasy Island and local reaction to the sale, see Wednesday’s Skegness Standard.